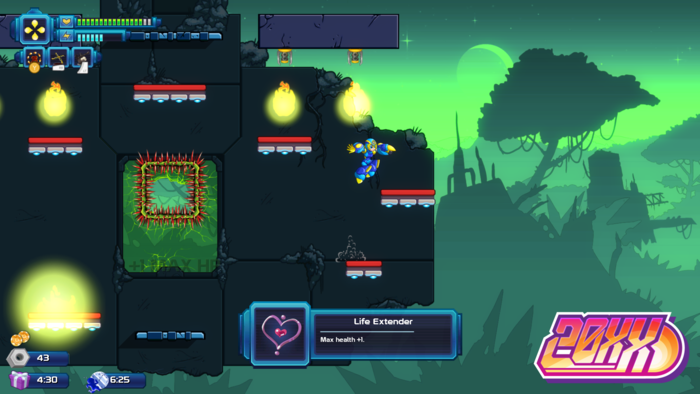 Developed by Batterystaple Games, 20XX is an interesting little platforming experience. The die-hard Mega Man fan in me was constantly at odds with what I was experiencing. “NO!…that’s…that’s just NOT right!”, I would scream incessantly at my television. “…YOU DON’T DO THAT IN A MEGA MAN GAME! !” I went on like this for quite a bit of time. But after I let myself calm down and somewhat begrudgingly 20XX grab me by the hand, I was left with a pretty damn good experience that was a lot more fun and innovative than I initially expected. At first glance, 20XX is everything you would expect out of a title that is entirely inspired by Capcom’s iconic blue bomber – particularly his X counterpart. Instead of Mega Man X and his saber wielding sidekick Zero, you have Nina and Ace (I didn’t care of the names either) who stand in restrictively as the heroes that players can choose from. All of the abilities/mechanics players would expect are present and accounted for: Nina can jump, shoot, charge and dash her way through enemies and obstacles while Ace uses a bladed weapon to slash throughout opponents at close distances. But the surface level gameplay (which again, is nearly a carbon copy of the Mega Man X series) sort of ends at the surface. 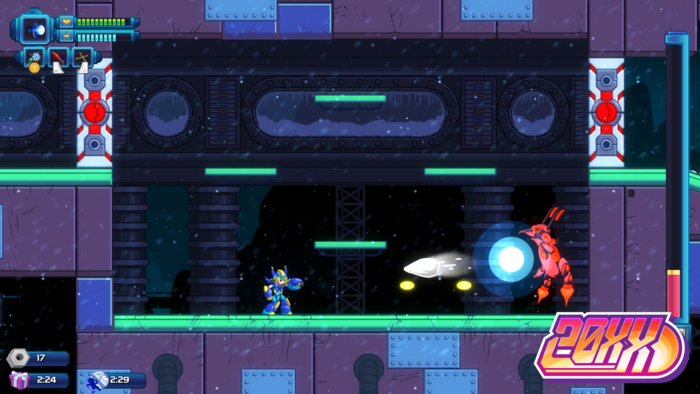 Once players take a glimpse at what’s hiding underneath, it soon becomes apparent that 20XX is so much more than a hollow clone of Mega Man. 20XX takes the traditional Mega Man format of choosing a roster of eight Robot Masters/Mavericks that the series is know for and instead replaces it with roguelike gameplay and procedurally generated levels. At first, I thought of this to be nothing more than a shallow gimmick (hence my conniption fit earlier). But after a few playthroughs, it all started to make remarkably good sense to me. It was – FREAKING GENIUS. Players are tossed into a random level with no indication of which boss they will be going up against. You have one life – so once that health meter runs out, that’s that. Upon making it to the boss and besting them (which arguably wasn’t that difficult for me) players are given a rather surprising option. Sure, it might seems like the common sense route to take the boss’s ability, but what about added health? Or boost Nina/Ace’s damage output? Or maybe up their defense stats? This is where the game completely diverts itself from everything players have come to expect from a Mega Man game and injects it with a bit of originality. It soon becomes apparent that the game is all about balance and picking and choosing between the right abilities and stat boosts to keep going and evading death for as long as possible. Make no mistake – death is inevitable. Fortunately, there is an upside to that as well. While death in 20XX means an entire run (along with any weapons/buffs players may have acquired) is completely reset, the situation isn’t as dire as one would assume. Players can collect a currency known as Soul Chips through each run which carry over and accumulate. Soul Chips can be used to purchase upgrades players can take on their next run or permanent stat boosts to health and damage output. 20XX wants to reward you for playing over and over again knowing that each time it will be a little more forgiving, but if players are ever in need of assistance besides grinding for Soul Chips and constructing a proper build, 20XX offers online co-op play so players can have a friend join in on the action (seriously, why hasn’t a Mega Man game done this?). One would think that after a solid week of the Mega Man X Legacy Collection 1 + 2, that I would be all mega-ed out. It turns out that I could not be more wrong as Batterystaple Games’ 20XX was able to provide me with a Mega Man X-like experience that I wasn’t initially prepared for. The game offers a lot of replayability in the form of Daily/Weekly events to keep players coming back for more. The randomized nature of each run makes the game hard to put down and the entire packaged is underscored by a very fitting soundtrack of electric guitar riffs. While some of the boss battles can be a little inconsistent and the level design can be a touch too hard to navigate through sometimes, it doesn’t take away from the overall experience. Mega Man fans looking for something fun to fill the void until Mega Man 11 (and hopefully Mega Man X9) needn’t look any further. 20XX was clearly developed by a team with an incredible passion Mega Man and their understanding of the genre and what makes it work really shines through. Playstation 4 Code for 20XX provided to Proven Gamer courtesy of publisher/developer Batterystaple Games.